Later forms of fortune telling such as the use of Tarot Cards followed in Greece, India, Italy, China and Egypt in around the 14th Century. Tarot cards were first associated with Gypsies who used the cards energies in order to process information about the seekers life. A tarot reading revolves around the belief that the cards can be used to gain insight into the current or future situations of the subject. Around the 19th and 20th Century, modern adaptations of the cards became popular in western culture, and is still far and away the most popular tool for spiritualists today. Other predictive forms of fortune telling include practices such as astrology, the ancient system based on the observation of stars and planets and their correlation with events on earth. Astrology has been developed over thousands of years by humans carefully observing, recording and mapping the skies. 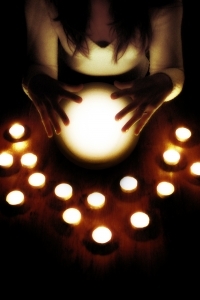 Numerology (the association between numbers and events) and crystal ball readings (where a reader uses a crystal or glass ball to aid the clairvoyance) are also hugely popular ways of looking into the future. When looking back over the history of fortune telling, the most remarkable thing is how, despite centuries of change and evolution, the demand for the art of the diviner has never dwindled as humans still strive to find answers and a glimpse into the future. If you would like to explore any aspect of fortune telling then why not give Psychic Light a call. Our readers are extremely gifted in many areas of fortune telling from Tarot reading to astrology, and you can check out at any time which of our readers is available to take your call. Happy searching, we hope to hear from you soon!